Adelaide has kicked seven, seven, eight and five goals in each quarter and managed their biggest win for their season. Rory laird had a careerhigh 36 disposals and Brad Crouch had 36 disposals. The trio of Josh Jenkins, Tom Lynch and Taylor Walker have functioned well for Adelaide. They have combined for 34 marks, 11 goals and each had at least 12 score involvements. 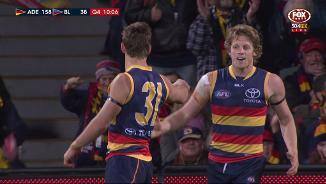 Adelaide's score of 170 is their highest score since 2000 against Brisbane. They are just 18 points from their highest ever score. Adelaide has 20 players with 18 disposals or more, whilst Brisbane still has ten players who are yet to register ten disposals. Adelaide has also won 174 more uncontested possessions. 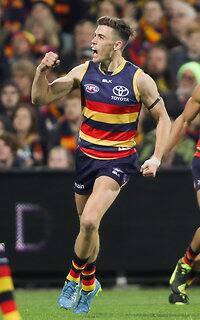 Adelaide have now launched 15 goals from 74 intercept possessions. This is the highest they have generated this year. Adelaide have the top 5 players in terms of metres gained, who have combined for 2208 metres gained. 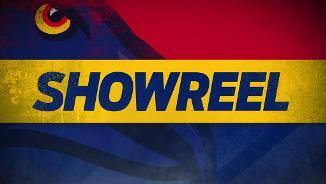 Brisbane have outtackled Adelaide by 13 so far and the clearances by three. However, their kicking efficiency has been 10 per cent lower than Adelaide in their forward half. 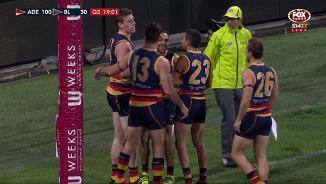 At three quarter time, Adelaide already have their 2nd highest score for the season. They have created 34 more inside 50's and launched an extremely efficient 35 scores. In Adelaide's last game, they outscored their opposition from intercepts by their highest amount this season. Prior to three quarter time, they have outscored the Lions from this source by 83. Adelaide has run harder and used the ball better than Brisbane, creating 53 more marks and 126 more disposals. Rory Laird has had 27 disposals, 15 handball receives and eleven score involvements. Adelaide generate the highest percentage of scores per inside 50 of any side in the competition. Tonight, they have surpassed that percentage by 11 per cent. Adelaide has created eight inside 50's to three this quarter as well as seven more intercepts. From those intercepts they have launched three more goals than the Lions. Daniel Talia and Jake Lever are both benefiting from Brisbane's ball use. They have ten and eight intercepts as well as nine and four score involvements respectively. Nine of Brisbane's twelve kicking turnovers have occurred in their defensive half, where their kicking efficiency is just 48 per cent. Adelaide have been clinical launching a goal from 25 per cent of forward half intercepts. Adelaide won the centre clearances by seven, disposals by 99 and their kicking efficiency was 17 per cent higher than Brisbane that quarter. They created ten more inside 50's launched seven more goals from intercepts for the half. This is the highest score Adelaide has generated in a half this year. Brisbane has been unable to transition from their defensive 50. They have created 20 chains in this zone and are yet to launch an inside 50. 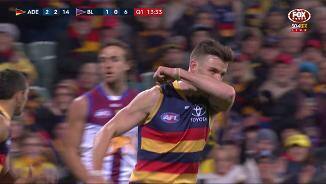 Consequently, Adelaide has launched six goals from just 13 attacking half intercepts. Adelaide's disposal efficiency is 7 per cent greater than their season average. On the contrary, Brisbane's is six per cent lower and they have already had 10 kicking turnovers. Adelaide's key forwards have been dominate.Josh Jenkins has six score involvements and Taylor Walker has four goals and a gamehigh 271 metres gained. Adelaide has created 24 inside 50's to 11 so far and they lead the uncontested possessions count by 62. As a result, they have launched five goals to one from intercepts in the midfield. Crows InterchangeDaniel Talia off due to an injury. Adelaide has won 11 of their 14 clearances in the forward half and as a result have launched five goals including two this quarter from stoppages. Brisbane's disposal efficiency of 76 per cent in their forward half is well above their disposal efficiency in their defensive half. 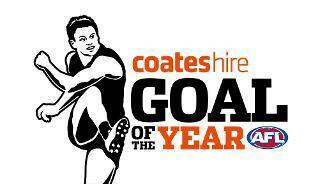 As a result, they have launched a goal from 36 per cent of inside 50's. Brisbane finished with 119 less disposals than Port Adelaide last week. Adelaide is on track to surpass that differential with 51 more disposals so far. Adelaide generated their equal highest most goals in any first quarter this season. They launched a goal from 50 per cent of inside 50's. Brad Crouch was extremely influential with three clearances and four score involvements. Adelaide is dominating the uncontested possession count 7039 in the early stages. They have created 13 more handball receives and launched two goals from their last five intercepts. 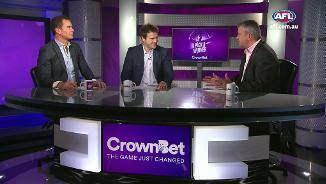 Crows InterchangePaul Seedsman and is possibly out for the game. Brisbane has been competitive around the ground, where they have won three more clearances and applied seven more tackles. Both teams have been inefficient from turnovers, launching a goal from just 8 per cent of their intercepts. However, Adelaide has been able to generate two goals from just seven clearances. Since round 10, Brisbane has conceded a score from 31.6 per cent of clearances. Adelaide has won the first four centre clearances and created three inside 50's from this source. Both teams have created seven intercept possessions each, but have been inefficient by footy. 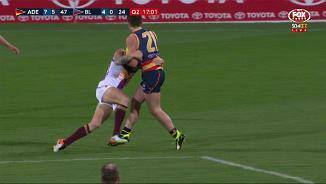 Adelaide and Brisbane have three and two kicking turnovers already. Adelaide has won four of the first five clearances, but their disposal efficiency at 47 per cent is well below their season average of 72.4 per cent. Brisbane has generated an inside 50 from 74 of centre bounce clearances this season. The fourth best percentage of any side this season. 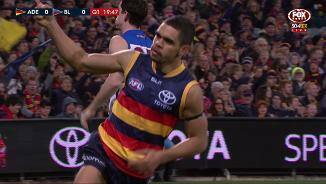 The Crows outscored the Bombers by 54 points from intercepts last week. This is their best result in any game this season. Welcome to Adelaide Oval for the Adelaide Crows v Brisbane Lions Round 20 clash. 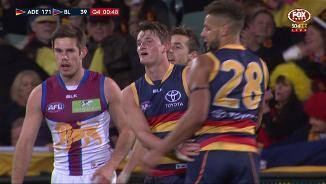 ADELAIDE has monstered the Brisbane Lions by 138 points at Adelaide Oval on Saturday night, showcasing its scoring power and earning a vital percentage boost in the race for the top four. Returning Crows skipper Taylor Walker grabbed his share of the spoils, matching fellow forwards Tom Lynch and Eddie Betts with four goals in the 27.15 (177) to 6.3 (39) win. The big win swelled Adelaide's percentage from 133 per cent to 141.2, and saw it leapfrog Geelong and GWS into third place on the ladder. Lynch (15) and Walker (12) took 27 marks between them and received terrific supply from the Crouch brothers, Rory Sloane, Rory Atkins, Charlie Cameron and Jarryd Lyons, while Kyle Hartigan, Rory Laird and Daniel Talia all dominated - and frankly, the list could go on. Rhys Mathieson was the Lions' only multiple goalkicker with two, while Ryan Bastinac and Dayne Zorko’s tackling pressure was admirable (12 tackles), but when your side is out-possessed 447 to 259, someone has to lay them. The Lions were simply never in the contest. 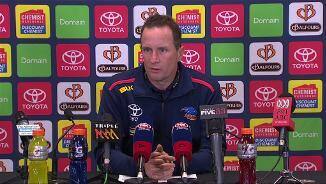 Never one to overstate a win, Crows coach Don Pyke described it as a "professional" performance. "To the players' credit I thought it was a real solid, professional performance for the whole four quarters," Pyke said. "Our ability to stay true to how we want to play [was most impressive] - we were strong around the contest, I thought some of our ball movement was good and I thought we defended the ground really well." Pyke's Lions counterpart Justin Leppitsch was left frustrated by his side's inability to match the Crows at the contest. "We wanted to keep the ball boundary side and they pushed us out of the way and we still got smashed on turnover. 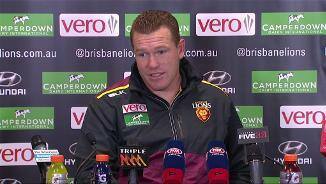 Last week we opened up the game and we got smashed because we missed kicks," he said. "That same turnover number's there every week. At the end of the day, you've still got to be able to win those contests at the coal face and not get pushed aside, which we are." Adelaide’s start couldn’t have been more emphatic; Cameron’s 12-second opener won't get him a place in the 100m final in Rio, but by AFL standards the game’s first goal was lightning fast. 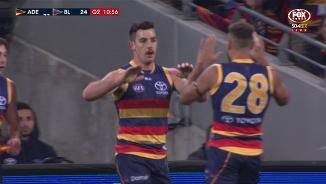 Adelaide's ball movement was slick, allowing Sloane and the Crouch brothers plenty of space on the outside and Lynch’s quarter-time siren goal gave Adelaide a 28-point lead. The Lions started the second term with more aggression and with their midfielders (Rockliff, Bastinac and Zorko), pegged one goal back before Adelaide flicked the switch. Brad Crouch was on fire in close, Cameron’s speed and agility was electric and Walker was in one of those moods up forward with four first-half goals. In the third term, Josh Jenkins kung-fu kicked his way onto the scoresheet, Eddie Betts snapped his third goal and despite Lewis Taylor’s shot edging through for the Lions the crowd’s focus switched to whether the Crows would crack 200 points. 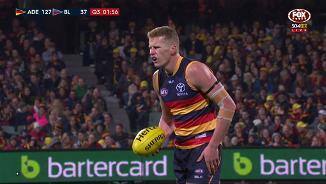 As the goals kept piling on for the Crows, debutant ruckman Reilly O’Brien cashed in late in the third quarter - taking a brilliant one-handed mark and converting to be swamped by his teammates in the process. The 200-point mark was within reach at the final change but as time slipped away Adelaide’s record score (188 against Essendon in round 10, 2006) loomed a more realistic target. The Crows fell short of that mark and finished just one point behind its largest win, a 139-point annihilation of Richmond in 1993. Adelaide: Defender Paul Seedsman suffered a corked buttock early in the game but with an eight-day break before the Crows take on Fremantle, he should have time to recover. 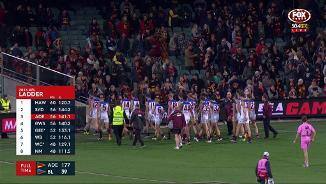 Brisbane Lions: The Lions recorded no injuries. Adelaide flies to Perth to face the Dockers in what looms another must-win, and very-winnable, match. After two-straight humiliations the Lions host Carlton and must try to win back some sort of pride in their performance. 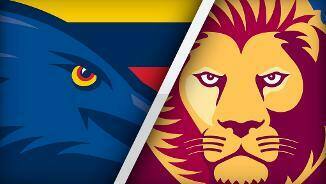 Adelaide: Walker, Lynch, Betts 4, Jenkins 3, Ellis-Yolmen, Sloane 2, Smith, Seedsman, O’Brien, Lyons, B.Crouch, M.Crouch, Brown, Cameron.